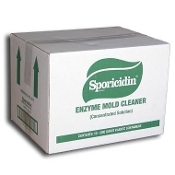 Case of 12 Quart (32oz / 946ml) bottles of mold cleaner concentrate. One Quart Makes 16 Gallons of mold cleaner. An effective enzyme combination of protease (to remove protein), amylase (to remove starch) and lipase (to remove fat), which also quickly dissolves and removes mold and organic matter. Recommended for use on floors, walls, ceilings, painted surfaces, metal, tile, concrete, cinder block, brick, carpet, fabric, upholstery, plastic, glass, vinyl, latex, wood studs, joists, beams, sub floors, and other materials subject to moisture.